Yep, this time we're sharing the love with North Canterbury - a show in Oxford and a show in Rangiora. Two classic old-time venues recently restored and perfectly suited to a night of mesmerising spoken word combined with music and a good old fashioned knees-up and throw down courtesy of the band described as 'one of the best modern roots bands' and 'toughest-minded songwriters'. - tickets available on undertheradar and on the door. Oma Rāpeti, Oma Rāpeti, Oma, Oma, Oma! In 2014 Catalyst and The Republic of Oma Rāpeti Press launched a new republic, complete with a flag, constitution, and national anthem. To celebrate this event, we have devised a new initiative to publish an annual poetry collection by three poets, inspired by the Penguin Modern Poets series of the past. The aim of this project is to produce a high quality literary anthology focused on just three poets, allowing a broader body of work to be showcased than a regular journal appearance allows. Volume One is subtitled 'Pioneers', reflecting both the emergence of the anthology and the vanguard poets featured, all with a history of pushing new frontiers in performance poetry in Aotearoa New Zealand. From collaborations with musicians both recorded and live, improvised storytelling, poetry slams, cabaret, multimedia poetry theatre, poetry road shows, touring with bands, and even live vinyl recordings, these three poets have pioneered a renaissance in performance poetry in Canterbury and across Aotearoa. Ben Brown has electrified audiences with his spoken word performances and smoky, malt whisky drawl. The excerpt from 'The Coffee Shop Philosopher', transfers his mana from the stage onto the page. Doc Drumheller’s excerpts from 'Hotel Theresa', and 'Lullabies for Insomniacs' reflect his travels as a troubadour presenting poems and songs composed in NZ, USA, and Eastern Europe. Andy Coyle’s deep velvet voice has been described as captivating and mesmerising, and his excerpt from 'Ode to the Cyclist' and other poems was recently published as a full manuscript by The Republic of Oma Rāpeti Press. Republic of Poets Vol. 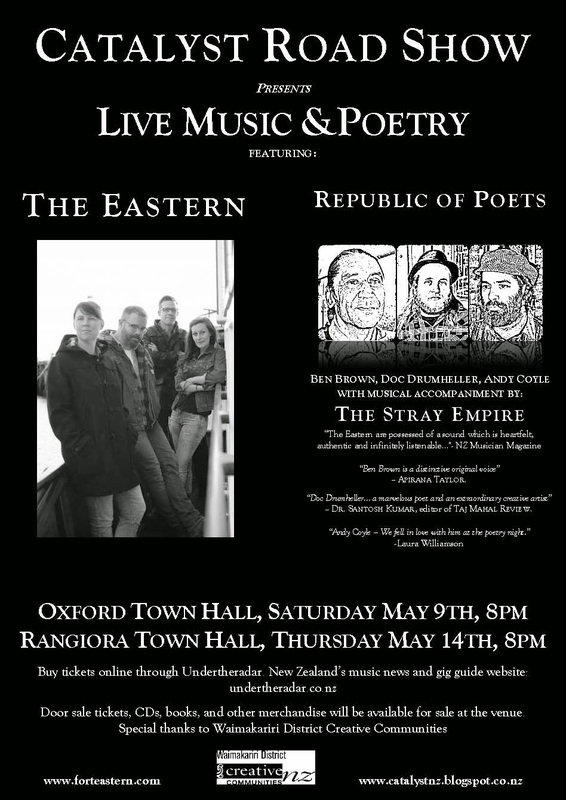 One was launched at live music and poetry shows throughout Aotearoa New Zealand, as the poets took this roving republic on the road. With performances at The Wunderbar, Lyttelton, The Dharma Bums Club, Wairau Valley, The Mussel Inn , Golden Bay, and The Free House, Nelson. The success of the tour led to performances in the Word Christchurch Writers and Readers Festival August 2014, and performances at LitCrawl in Wellington, November 2014. 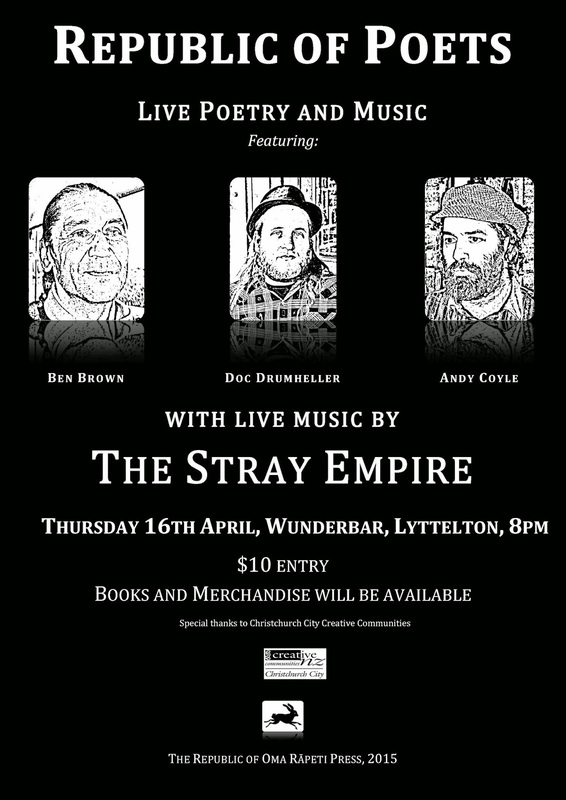 Their next show will feature performance poetry and live music with the Stray Empire at the Wunderbar, Lyttelton, Thursday, April 16th, 8pm. $10 on the door. Tickets, books, and other merchandise will be available for sale at the venue. -- Dr. Santosh Kumar, editor of Taj Mahal Review. "Andy Coyle: We fell in love with him at the poetry reading." Ben Brown (Ngati Paoa, Ngati Mahuta) was born in Motueka in 1962. He is a writer, poet and performer. Since 1992 he has published numerous children's books, short stories for children and adults, poetry and non-fiction, and is an occasional contributor to Mana Magazine who have also featured him. He tours and performs regularly around the country. In 2006 he won best picture book with the artist/illustrator Helen Taylor in the New Zealand Post Book Awards for Children and Young Adults. In 2011 he was the Maori Writer in Residence at the Michael King Writer's Centre. He was also writer in residence at Hagley College, Christchurch, in 2009. He has read and performed at the Auckland Writers Festival (2010), the APRA Music Awards (2011) the Christchurch Writers Festival (2006, 2012), the Kaikoura Roots Festival (2012) the Christchurch Arts Festival (2009, 2013) and the Nelson Arts Festival (2011). He lives and works in Lyttelton. Andy Coyle is a performance poet based in Canterbury, NZ. In 2011 he represented Christchurch in the NZ Poetry Slam finals. He is a regular contributor to the Catalyst Open Mic Night, The Catalyst Literary Journal, and the Catalyst Road Show. Career highlights include, a ten date tour of New Zealand in 2010; writing and performing an epic poem set in Chch accompanied by a 7 piece progressive jazz/rock ensemble for the Dunedin Fringe and the Wellington Jazz Festival in 2006; a short story filmed; a play performed; a poem painted as a mural in the seaside suburb of New Brighton and festival appearances in the Wanaka ‘Outspoken Festival’, the Lyttelton Summer Festival, and the Newtown Street Festival. Doc Drumheller: was born in Charleston, South Carolina and has lived in New Zealand for more than half his life. He has worked in award winning groups for theatre and music and has published ten collections of poetry. His poems have been translated into more than twenty languages and he has performed in Cuba, Lithuania, Italy, Hungary, Bulgaria, Romania, Japan, India, Nicaragua, USA, and widely throughout NZ. He lives in Oxford, where he edits and publishes the literary journal Catalyst and teaches creative writing at the School for Young Writers. Aaron Boot: is a local musician who has toured extensively throughout New Zealand, Australia, Europe, The UK, and Ireland. He co-wrote songs with the artist Speech Debelle on the Mercury award winning album Speech Therapy. He has worked as technician on festivals like the Big Day Out, Future Music, and has worked as a stage tech for Alice Cooper, Faith No More, The Chemical Brothers, Kenny Rogers, Rage Against the Machine, and many more of the world’s leading musical acts. The Stray Empire is a two piece country/folk/rock ensemble playing covers and original music. Their original songs are composed on the ukulele, banjo, mandolin and guitar, combining poetic lyrics with folk and pop sensibilities. 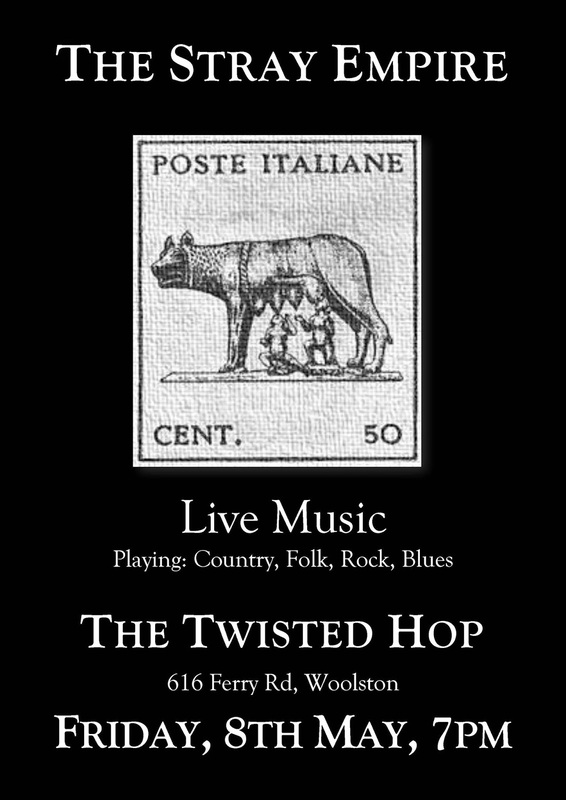 They cover songs by Townes Van Zandt, Old Crow Medicine Show, Bob Dylan, Little Feat, and many more.